A platform empowering UAE talent. Amongst all other masterminds, was also the all-new 2017 Mercedes-Benz E-Class, premiering at its classiest best. Dubai, June 04, 2016: Artistic, inspiring and impressively modern, the first-ever ‘She’s Mercedes’ event in the region was hosted by Gargash Enterprises at the Leila Heller Gallery on Saturday June 4th, devoted to encourage, connect and empower local women to unleash their best. Bringing together various communities of professionals, She’s Mercedes celebrates exceptional personalities who share exclusive insights and pioneer pushing the boundaries. Latest collections of ladies handbags, kaftans, jewellery and intriguing summer accessories, artistically designed by brands such as ESSA, HAGAR & INDIA, HANAH Dubai, and S*UCE were exhibited at the event. Shehab Gargash, Board Member of Gargash Enterprises said “‘She’s Mercedes’ is an extension of our commitment towards the growth of our local talents. By providing them a platform to showcase their skills and flourish, we move closer to our aim of empowering talented individuals. We have always been futuristic in our approach towards inspiring art and we strongly believe in the advancement of the society. In our constant endeavor of promoting local talent, Gargash Enterprises has supported several events and activities that act as a spring board for upcoming talents; this is one such event, and we are delighted to be hosting it”. HANA COLLECTION, an Emirati luxury leather goods brand, was created by Hana Al Matrooshi, one of the first Emiratis to design leather bags. With a degree in Business IT, she decided to venture in the world of fashion and pursued her career in designing and manufacturing her own brand since Oct 2010. Pioneering an indomitable new generation of über-cool fashion designers emerging in the Middle-East, ESSA Walla, UAE’s king of kaftans has revolutionized a whole new chapter in Arab Fashion. He comes from a school of old craftsmen that taught him pattern making, and it was in a little hub of old Dubai where he honed his skills and took his level of creativity to another standard. S*UCE, on the other hand is a complete style wardrobe for connoisseurs of fashion; a multi-brand fashion and lifestyle concept based in Dubai. The first S*uce opened at the Village Mall in Dubai in 2004, and has grown ever since from a relatively small retail destination in Jumeirah to an award winning fashion and lifestyle phenomenon. While HAGAR & INDIA showcased an incredible range of fine luxury jewellery and accessories meticulously designed in Italy. An interpretation of modern Emirati culture; the collection embellished with rare and precious gems wooed the ladies and men alike. The day not only brought aesthetic creations into the limelight, but also showcased the all-new 2017 Mercedes-Benz E-Class. Dynamic, exciting and impressive, the new model comes with numerous technical innovations which undoubtedly will strike a chord with car enthusiasts. The 10th generation of this executive sedan advances the cause of refined motoring once again. New, intelligent assistance and safety systems see Mercedes-Benz taking another step closer to its goal of accident-free and autonomous driving, making every trip an experience. Designed to impress, the beautifully crafted front seats, center console, instrument cluster and rear seats promises hallmark E-Class comfort with a pleasantly generous amount of space. The interior embodies the synthesis of emotion and intelligence poles that are defined by the Mercedes-Benz design philosophy. Matching the exclusive interior style and high quality workmanship is the stunning looking, appealing and exceptional exterior design. Confidently stylish and sporty, the all-new E-Class is the perfect show stopper for any occasion. The new generation engine combined with autonomous driving feature assures a unique level of comfort and a safe driving experience. A powerful front, sweeping side design, coupé-like flair for the tail end and up to 20-inch broad alloy wheels with a calming ambience in the interiors, the E 200 is identified as a prestigious and style setting vehicle which symbolizes the brand values of Mercedes-Benz in a special way. “Mercedes-Benz is taking a big step into the future with the new E-Class. 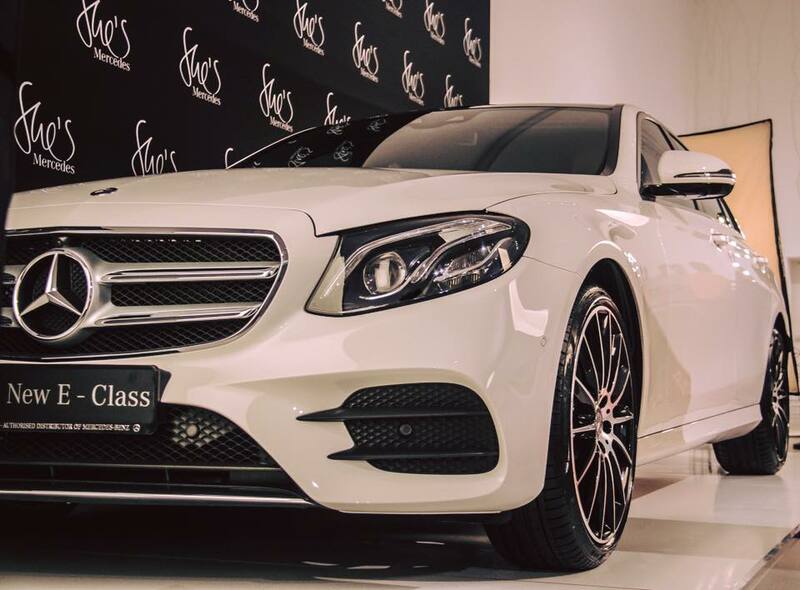 Introducing the E-Class at this event was an addition to our aim of portraying innovation in its finest form. This masterpiece of magnificence stands true to its shine and heightens the glamour quotient of the event manifold. All the features combined, the E 200 is rightly positioned as the world’s most intelligent sedan in the business class” said Karl Johan Sandesjo, General Manager, Gargash Enterprises. Gargash Enterprises has been the authorized General Distributor of Mercedes-Benz in Dubai, Sharjah and the Northern Emirates since 1958. With showrooms and service centres across Dubai, Sharjah, Ras Al Khaimah and Al Fujairah; Gargash Enterprises provides customer focused operations representing the Mercedes-Benz brand in the best possible way.